Charles Chubb and his younger brother Jeremiah, were born at Fordingbridge in Hampshire; Charles in 1772 and Jeremiah in 1790. Having been apprenticed as a blacksmith, Charles opened a business in Winchester before moving with his brother to Daniel Street, Portsea, now part of the Naval Dockyard area of modern Portsmouth, in 1804. The brothers carried on a very specialised business as ships' ironmongers. Sailing ships carried so many metal components peculiar to them, it was necessary to have specialists who could supply and, when required, carry out repairs to these items. On Feb. 3rd 1818, Jeremiah was granted a patent for his Detector Lock. He also won the reward (100 Guineas) offered by The Government for a “Lock that could not be opened by any but its own key”. The money was put to good use in founding Chubb Lock Manufacturers. Knowing that the best locksmiths were located in and around Wolverhampton, the brothers opened an Office/Workshop at Temple Street, in June 1818. Lock making was Jeremiah's responsibility. Charles opened the company’s London Office at 57 St. Paul's Churchyard in 1820. The Portsea Business continued trading as Ships Chandlers for another 15 years. When it closed in Feb.1835, the entire stock of 3,000 lots was sold at auction. Whether or not the story is true that the initial success of the Detector Lock came about as the direct result of the Prince Regent sitting down on one (with key protruding)! There is no doubt that it quickly came to be regarded as the best of its kind. Royal Warrants were introduced by Queen Victoria; before this, the Royal Household awarded Special Licences to their selected suppliers. Chubb’s first Special Licence was granted in 1823 by King George IV. Among other early customers of note were the Duke of Wellington - four locks and a new key for Apsley House - and the Bank of England - two locks priced at 6 guineas each. 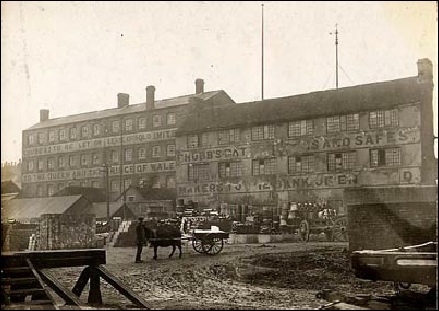 Chubb Lock Manufacturers occupied the workshop in Temple St.(pictured right) Wolverhampton, until 1836. 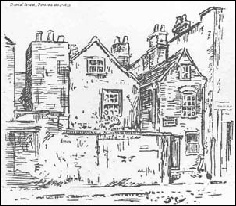 Then followed a brief period at premises in St. James' Square before moving to a large building at the junction of Horseley Fields and Mill Street in 1838, where they remained until the leasehold expired in 1882. Workshop space was very limited at Temple St. and St. James’ Square so Chubb had very few locksmiths working at these premises. There being no shortage of these craftsmen many orders were sub-contracted out. 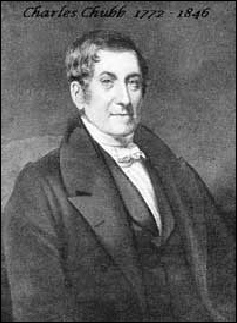 Early in the 1820s, Jeremiah left the Company and emigrated to America. For the next decade Charles ran the Company single-handed but with loyal support from certain employees. CHUBB & SON PATENT LOCK & SAFE MAKERS TO THE QUEEN AND THE PRINCE OF WALES. The words on the other building reads CHUBB’S PATENT LOCKS AND SAFES, MAKERS TO THE BANK OF ENGLAND. The Horseley Fields building was an interesting one in that it had been a Prison and Workhouse before its occupation by Chubb. On moving in, they found a pair of Chubb Leg Irons (See Photographs page) shackled to a wall. These were still in place until the building was demolished in the 1950's! Chubb registered their first patent for a burglar-resistant safe in 1835. 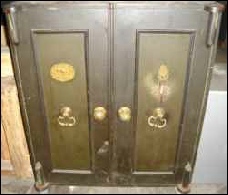 Although they were supplying safes bearing their name before this date, they were not manufacturing the items. These units were secured with Chubb Locks and by agreement with the maker, fitted with a CHUBB nameplate. In 1837, they opened a factory at Cowcross Street (Smithfield), London, and began the manufacture of safes and strongroom doors. Production continued here for the next 30 years before a move to larger premises. In 1866 they re-located the factory to a new site, south of the River Thames in Glengall Road (a turning off the Old Kent Road). The roofed-in area was about 6000 sq. yds. In the early years production was exclusively of Fire & Burglar Resistant Strongrooms, Safes and Chests. There was employment for between 120 and 150 workers, falling into three categories; skilled safe makers, machinists and labourers. Room had to be made for Lock Making when the lease on Horseley Fields ran out in 1882. Glengall Road closed in 1908 and all production transferred to the new safe works at Wednesfield Road, Wolverhampton. 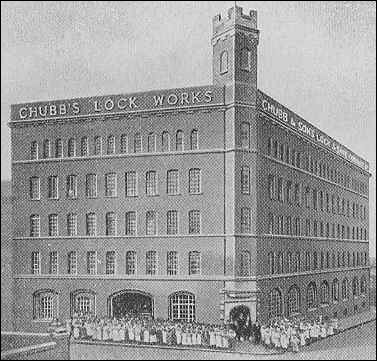 Incorporation being granted in 1882, the name became Chubb & Sons Lock and Safe Co. Ltd. and early in the 1890s planning began for a new purpose built Lock Works at Wolverhampton. This was opened in 1898 to celebrate the 80th anniversary of the founding of the Company; capable of accommodating 350 workers, it was located in Railway Street, Wolverhampton. A new safe making department was included although Glengall Road continued to be the main production centre for the large Safes & Strongrooms. T his picture (right) dates from 1900 - if it was taken during the working day, production would have dropped or perhaps the staff missed lunch! The triangular design around an inner courtyard, whilst unusual, was extremely practical. 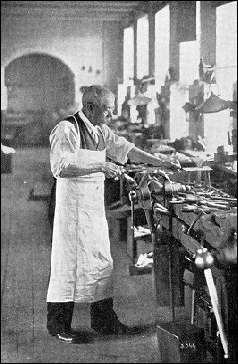 The large windows on each side of every level provided the maximum amount of natural light, each locksmith's bench having its own window as shown in this photograph (above left) of Harry Inscoe at work on Oct. 9th 1918, having completed 60 years of service! Lock manufacturing began in early 1899 and continued at this site for the next 39 years. Since the building is close to and visible from today’s main Railway Station, many first time visitors see the name on the building, and think they have found Chubb’s. Being 'listed', the exterior of the building cannot be altered and the name is incorporated in the brickwork. 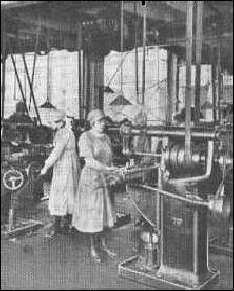 I’m unable to say when the Company began employing women on the shop floor although I suspect it was almost as soon as they introduced machine lathes for the manufacture of lock components. This might have been at the Horseley Fields Factory. There were certainly plenty of machines in use at Glengall Road. There are many women in the picture of the new Railway St. Factory and the ladies in this photograph of part of the machine shop were no doubt delighted to be singled out for a second photograph! 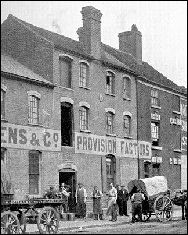 In 1908, a new Safe Works was opened on Wednesfield Road, about one mile from Railway Street. Production transferred from London and the safe making department at Railway Street also moved to the new location. The transfer from Glengall Road was organised like a military operation, to minimise loss of working time. The staff left London on a Thursday afternoon, were given the rest of the week to find accommodation in Wolverhampton for themselves and their families and entered the new works on Monday morning to find everything ready for work to begin. Chubb celebrated their 120th anniversary in 1938. To mark the occasion, the then Chairman (Lord Hayter) opened a new extension to the Wednesfield Road factory at a ceremony that coincided with his 90th birthday. The new buildings comprised lock works and offices bringing the total factory area to over six and a half acres. 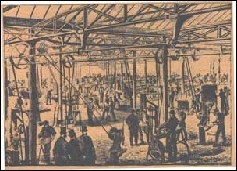 Staff at the Railway Street factory moved to the new lock works and once again, production of Locks & Safes was located at one dedicated site. In 1947 one of the first major policy decisions was the move away from hand made locks. While retaining the craft-built lock for specialised functions, Chubb began to produce a range of locks using many machine made components. The locks were hand assembled and designed to offer a high degree of security at a reasonable price. In the 50's & 60's the Company expanded its security interests through various acquisitions amongst which were Hobbs Hart & Co. Ltd. in 1956 and Josiah Parkes & Sons Ltd. makers of UNION locks, in 1965. For more detail about the takeovers together with Branch Office locations, the Chubb Group Companies, Chubb overseas and the current owners of CHUBB, please see ‘Sales History’. from the Chubb Collectanea 1818 - 1968"
This booklet was compiled by Noel Currer-Briggs MA at the request of the Chubb Directors, to mark the 150th anniversary of the founding of the company. for the Victoria Railway Company. Serial numbers of Locks date from 1859. Harry Inscoe at work on Oct. 9th 1918, having completed 60 years of service! Workshop in Temple St. Wolverhampton, Ocupied until 1836.